Groovy Lab in a Box teaches modern ideas the old-fashioned way - with hands on fun! 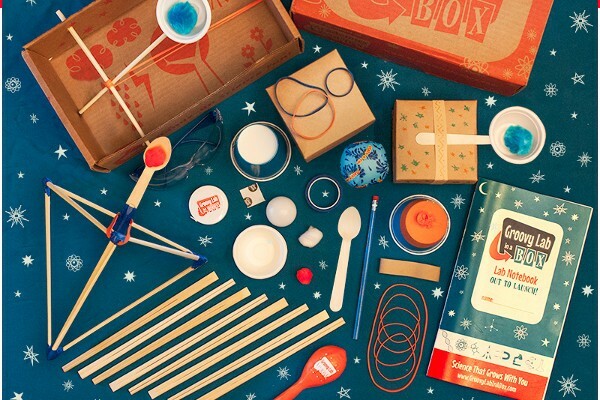 Groovy Lab in a Box teaches modern ideas the old-fashioned way – with hands on fun! Monthly boxes that turn up at your door full of entertaining science experiments will keep curious kids very happy. A wonderful way to combine learning and laughter. Let’s just take a moment to enjoy the handsome retro design of these boxes. They hark back to simpler days when playing involved building something in the backyard rather than a console and controllers. And that is exactly what is inside: interactive science games that provide hands-on learning fun. It’s no surprise that Groovy Lab in a Box has already won some awards for their brilliant boxes. They are designed to teach STEM subjects (science, technology, engineering and mathematics) using the Engineering Design Process of learning. In a nutshell that means they harness the natural curiosity of kids to drive learning and nurture that satisfying feeling that comes from solving puzzles and creating new ideas. The fun goes beyond the box with access to online videos and games that will further explore the ideas learnt in doing the experiments. Groovy Lab in a Box is available for a monthly subscription so that a new kit arrives on your doorstep every month, or you can just purchase a single kit to give it a try. Any kid with an adventurous mind is sure to be delighted. These exciting activity boxes are not yet available for shipping to Australia but they are working on it and we at Babyology will let you know once they announce! Meanwhile, you might like these six simple science experiments for preschoolers and toddlers.